Have you been told you have Degenerative Disk Disease? If so, welcome to the club. If you live long enough, you will get it. If you think about it, degenerative disk disease really should not be called a disease, as it is the normal process of disk degradation. It is like saying aging is a disease, which we all know it not true. So, how does the degenerative disk disease process begin? It really starts almost from childhood. As you develop and grow, the intervertebal disk, does get subject to increasing forces. As we have discussed before, the disk is made of two components, the annulus, which is a tough woven outer structure that contains the softer, initially more jelly-like, full of water, shock absorbing center. With a full of water center, there is enough water pressure to maintain the side walls of the disk. The walls are nice and straight. The disk is also firm. With the height of the disk, and strength of the well hydrated disk, it acts as a spacer between the vertebrae. Secondary to the space, nerves can easily exit out of the spinal canal in the holes called the foramen. In the normal disk, there is plenty of room for the nerve to exit out the center of the spinal canal but, with a degenerated disk, the space narrows, potentially pinching a nerve in the process. As we stated above, when the disk is full of water, the pressure in the disk is such that the disk is of a normal height. But, the side walls are also flat. The often used analogy is that of the car tire. When properly inflated, the tire side walls are flat, and the tire is firm, giving a better, more controlled ride. When the disk starts to lose its water content, which is a necessary component of the degenerative disk disease process, the side walls begin to bulge, and the strength and firmness of the disk reduces. In the side wall bulging process, it can also cause further narrowing of the space for the nerve sacs. By losing some of its firmness, it can allow extra motion of the vertebral bones upon one another. This extra motion causes the facet joints, located in the back of the spine to rub excessively on one another causing development of facet joint arthritis. Also, the extra motion of the vertebra on one another can lead to instability or slippage of the vertebra, potentially causing further irritation of the nerves. This process can lead to what is called degenerative spondylolithesis. Luckily, the process is usually very gradual. 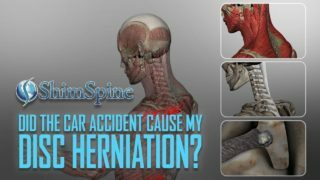 In fact, there are plenty of people who live their whole life without any significant episodes of back, neck or extremity pain, even though their backs and necks may look horrible to a spine surgeon like me. In general, by age 20 about 15-20% of the population will have some evidence of degenerative disk disease. By age 40, it will be a majority that will have these changes. And, unfortunately for most, degenerative disk disease can cause pain. The source of the pain can be secondary to the pinching of the nerves, or the arthritis of the facet joints, or the related pain associated with the muscles attaching to these joints. Also, secondary to the potential development of the spinal instabilities, the muscles often will need to work extra hard to keep the bones properly aligned and not rubbing against each other, or pinching the nerves. This extra work may explain the increasing muscle aches to the neck and back. Also, with further collapse of these disks, and reduced heights, the overall normal body curvatures, Lordosis, and kyphosis, can be reduced. 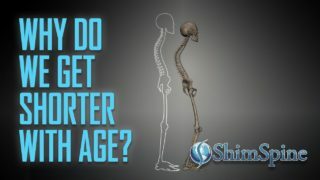 And, because of the reduction of curvature, and the arthritis to the facet joints, we experience increased stiffness as we age. For the more mature reading audience, I think all these points do sound familiar. Fortunately, we usually learn to accomodate these changes, and we have medical treatments such as anti-inflammatory medications, muscle relaxers and narcotics to treat the severe episodes. If necessary, we can also use corticosteroid injections to accelerate the reduction of the inflammation. In certain relatively rare situations, surgery may be necessary to help with the pinched nerves or instability. Help yourself by doing the proper things. Stay disciplined by not smoking, not gaining weight, and eating properly. Get exercise, and stretch. But, in the end, we need to accept some of this is secondary to the aging process. As I discussed with my patients, it is better than the alternative.